The Russian RD-180 rocket engines seen here are used to launch expendable Atlas 5 rockets operated by the U.S. launch provider United Launch Alliance. Space industry experts told senators on Wednesday, July 16, 2014,that the United States is too dependent on Russian rocket engines for its own military launch needs. Should the Russian government yank its supply of rocket engines for United States launches, critical national-security satellite missions could be delayed up to four years, experts told a joint Senate hearing Wednesday (July 16). 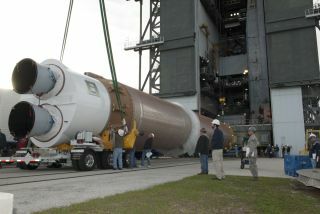 United Launch Alliance's (ULA) Atlas 5 rocket is the workhorse of heavy satellite launches in the United States, but the booster requires a Russian RD-180 engine to get off the ground. "If you look at what has happened to us now in the past few months, it points to a vulnerability," Gen. William Shelton, head of Air Force Space Command, told senators in remarks broadcast on the web from Washington, D.C.
"We decided to rely on a foreign supplier — with probably the most advanced rocket engine in the world, by the way — and that has worked extremely well," added Shelton, who said that it is nevertheless time to look to new strategies for the future. The hearing included the Senate subcommittee on strategic forces and the committee on commerce, science and transportation. ULA has just 15 RD-180 engines left in its stockpile. The U.S. military currently uses about six to seven rockets a year, but other government agencies such as NASA also require Atlas 5 launches, Shelton said. The Delta 4 can only carry smaller and medium-sized satellites, but that rocket could take on some of the burden. "We've got to ramp up the production of our Delta factory, which would take some time. That would stretch out launches maybe 12 to 20 months, and for the heavier missions maybe 48 months," Shelton said. While SpaceX could be certified as early as this year, the Falcon 9 rocket is only capable of taking on medium-sized or smaller satellites, said Alan Estevez, the principal deputy under-secretary of defense for acquisition, technology and logistics. It would take five to eight years to develop an American alternative to the RD-180 engine, he estimated. Estevez's department is doing a financial assessment of how to replace the RD-180, which should be complete in September. Access to space could also affect the International Space Station, although a representative for NASA said that relations with Russia remain smooth so far. "There's no change to behavior at all," said NASA associate administrator Robert Lightfoot. "Our teams are working together with the Russians very well to continue space station operations." That said, Rogozin also quipped via Twitter a few months ago that if the United States wants to send its astronauts to space alone, it should use a trampoline. All American crewmembers have launched to the orbiting lab aboard Russian Soyuz capsules since NASA retired its space shuttle fleet in 2011. While NASA is encouraging the development of private American astronaut taxis through its commercial crew program, such spaceships likely won't be ready until 2017 at the earliest. Lightfoot said that even with more money, it would be difficult to push the readiness date up given there are certain checks and milestones that would have to be achieved. Russians also operate several "key components" on the space station, added Lightfoot, saying that NASA would have to look at the situation more closely if relations between the two nations soured further.